There’s a large range of accessories available for insulin pumps these days catering for a number of different uses and sometimes available in a number of different colours and styles. This guide gives you an idea of which accessories are available for insulin pumps as well as some alternative suggestions if an exact product is not available for your pump. We start with a range of, clips, pouches and cases and then go into other accessories such as skins and accessories designed for children. Clips and holsters usually help to secure your pump to a belt, waistband, pocket or another part of clothing. You may be able to get holsters designed specifically for your type of pump or you may be able to use a holster designed for holding a phone or similar electronic item. Bum bags and insulin pumps have been good friends for many years and a number of waist held pump bags closely resemble the appearance of a bum bag. Bum bags can usually be adjusted and some may be worn over one shoulder across the chest or back, in addition to around the waist. These pouches generally clip onto the middle of the bra between the cups and the pump hangs down. Depending on which top you choose, bra pouches can make accessing your pump relatively easy and fuss free and helps keep your pump secure and out of the way. Thigh pouches offer extra flexibility and can be a good if you’re looking to conceal your pump say when wearing dresses and skirts. Specific thigh pouches for insulin pumps are available from some manufacturers. Arm pouches give another option and place on your body to hold a pump. As with thigh pouches, arm pouches specifically for insulin pumps may be available from some manufacturers, whereas some people make use of arm bands designed to work with phones and MP3 players such as iPods. If you want to keep your insulin pump right out of the way, an insulin pump harness can allow you to wear your pump in the middle of your back. This can be useful for some sports including jogging. Insulin pumps involve a bit more kit than insulin pens and so having a good kit bag or carrying case for your pump and consumables is often a good idea. A carry case needn’t be specifically designed to be used with insulin pumps but having a specifically designed case may help to save space and/or keep your kit well organised. It is possible to get waterproof cases for storing an insulin pump in places likely to get wet. Note that most waterproof cases won’t have been tested for waterproof functionality with the insulin pump in use. For specific advice on keeping your insulin pump protected from water, it’s best to contact the manufacturer who will be able to give you advice with consideration to your insulin pump’s warranty, which could come into play should your insulin pump suffer water damage. Skins allow you to personalise your insulin pump so that precious little box (your pump) reflects your personality. 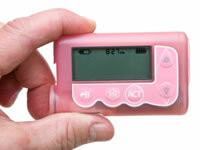 Many insulin pump manufacturers offer the chance to choose from a range of skins to match your personality and style. It’s important for children to feel comfortable with their pump and there are a number of options to make pumping that little bit more friendly for children. A number of companies have designed some really bright and wacky insulin pump carry cases and pouches, many of which will appeal to children. Have a look around on the internet and you should be able to find a design your child will love.